Steel is a versatile metal manufactured in one of two ways: hot rolled steel and cold rolled steel. Hot rolled steel can be identified by its grayish-black coating–indicative of the iron oxide protective layer. It is resistant to rusting, and can be used for tanks, tubing, drainage, irrigation lines, billboards, culvert, water lines, fabrication, fence posts, slurry lines, piping, gas lines, air lines, and more. Cold rolled steel is smooth and bright, and is used in the manufacture of items such as screws and nails. 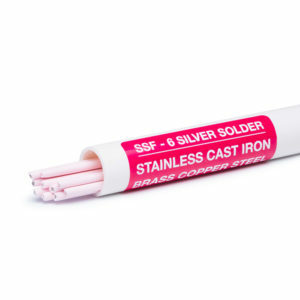 At 56% silver, SSF-6 Silver Solder is ideal for brazing all types of steel. This video gives step by step instructions for repairing steel pipe with an oxy-acetylene torch.